The new state-of-the art "Team UTE" service facility. UTE is a full service provider with the ability to keep you safe and free of downtime. We have a dedicated and knowledgable staff of mechanics and technicians to serve all of your mechanical needs. Our mobile service trucks can be dispatched to your location or wherever there is an emergency. 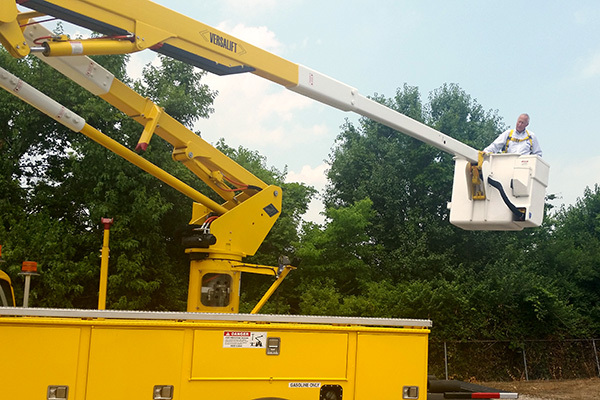 When it is time to get your aerial device inspected, UTE can arrange your annual structural and dielectric physical. .
Utility Truck is certified to service a wide range of makes and models of utility vehicles. Our service bays are spacious and there is plenty of parking. Inspecting your bucket truck or digger derrick is critical to keeping your unit in peak condition. Inspection begins with a visual assessment of your unit for cracks and general wear and tear and covers every point on the unit including filter changes and lubrication. Contact our Service Manager, Rick Kanoski, at (740) 500-1189 from 8AM to 5PM EST, or leave a message on the comments page of this web site. We provide training for your mechanics and operators. Limit your liability and increase production with professional training. From UTE. Aerial equipment operators’ training to meet ANSI and OSHA requirements.